In the Senate race, Bill Nelson, the incumbent Democrat, is favored by 48 percent of likely voters, while Republican Rick Scott, the state's governor, gets 45 percent. Democrats are ahead in the competitive Senate and gubernatorial races in Florida, according to a new NBC News/Marist poll of this key battleground state, although their leads are within the margin of error. 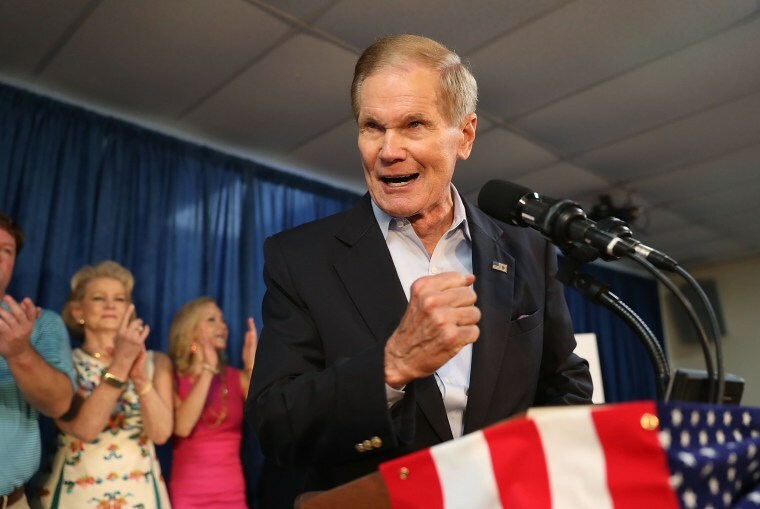 In Florida's Senate contest — which could help decide which party controls the U.S. Senate after November — the Democratic incumbent, Bill Nelson, gets support from 48 percent of likely voters, while Republican Rick Scott, the state's governor, gets 45 percent. Six percent say they're undecided. Among the larger pool of registered voters, Nelson leads by 5 points, 48 percent to 43 percent, which is essentially unchanged from his four-point edge in June's NBC/Marist poll. And in the gubernatorial race — arguably the nation’s top contest for governor — Democrat Andrew Gillum is ahead of Republican Ron DeSantis by 5 points, 48 percent to 43 percent. Among registered voters, Gillum’s advantage expands to 8 points, 49 percent to 41 percent. “The political environment in Florida, overall, is tipping in the Democrats' favor,” said Lee Miringoff, director of the Marist College Institute for Public Opinion, which conducted this survey for NBC News. In the Senate contest among likely voters, Nelson leads with African-Americans (78 percent to 15 percent), young voters ages 18-29 (65 percent to 30 percent), Latinos (57 percent to 37 percent), independents (53 percent to 37 percent) and women (53 percent to 40 percent). Scott, meanwhile, is ahead with whites (52 percent to 40 percent), men (50 percent to 42 percent) and likely voters 45 and older (48 percent to 45 percent). In the gubernatorial race, Gillum is up with African-Americans (86 percent to 9 percent), those ages 18-29 (61 percent to 30 percent), women (54 percent to 37 percent), Latinos (52 percent to 38 percent) and independents (51 percent to 38 percent). And DeSantis holds the advantage with whites (51 percent to 41 percent), men (50 percent to 42 percent) and those 45 and older (47 percent to 45 percent). Nelson and Gillum also enjoy higher favorable ratings than their GOP opponents do. Forty-four percent of likely voters hold a favorable view of Nelson, versus 36 percent who have a negative view (+8). That’s compared with Scott’s 46 percent-to-45 percent rating (+1). And for Gillum, 46 percent of likely voters give him a thumbs-up, versus 27 percent who give him a thumbs-down (+19). By contrast, DeSantis’ fav/unfav rating is 42 percent-to-37 percent (+5). The NBC/Marist poll also finds 46 percent of likely voters in Florida approving of President Donald Trump’s job performance, while 48 percent disapprove. Among registered voters, it’s 44 percent approve, 48 percent disapprove — essentially unchanged from June, when it was 45 percent approve, 46 percent disapprove. In addition, the poll shows Democrats leading Republicans by 3 points in congressional preference: Forty-eight percent of likely voters say they prefer a Democratic-controlled Congress, while 45 percent want Republicans in charge. Among registered voters, the Democrats’ edge grows to 6 points, 49 percent to 43 percent — up from their 3-point advantage in June. And by 52 percent-to-40 percent margin, likely voters in Florida say their vote in November will be a message for more Democrats to check and balance Trump, rather than more Republicans who will help Trump pass his agenda. Finally, the top issues in Florida are health care and the economy, according to the poll. Twenty-four percent of likely voters list health care as the No. 1 issue that might decide their vote for Congress in November — followed by the economy and jobs at 23 percent, immigration at 17 percent and guns at 10 percent. Among Democrats, the top issues are health care (35 percent of Democrats say this) and guns (17 percent), while the top issues among likely Republican voters are the economy (29 percent) and immigration (22 percent). The NBC/Marist poll of Florida was conducted Sept. 16-20 of 829 registered voters, which has a margin of error of plus-minus 4.0 percentage points. And the margin of error for the 600 likely voters is plus-minus 4.7 percentage points.